Global consumer electronics vendors experienced a challenging environment in 2016, due to the shift in product preferences of savvy buyers. With the exception of Chromebooks, the personal computing category has not had the market demand or device shipments that could sustain the vendors. Case in point; consumer spending during the holiday quarter of 2016 was clearly not aimed at consuming media tablets, as the market continued its downturn. The fourth quarter of 2016 (4Q16) marked the ninth consecutive quarter that tablet shipments have declined. Vendors shipped 52.9 million tablets in the fourth quarter, which was a decline of 20.1 percent from the same quarter one year ago, according to the latest worldwide market study by International Data Corporation (IDC) . Similarly, shipments of 174.8 million units for the full year 2016 were down 15.6 percent compared to 2015 -- marking the second straight year of declining shipments of media tablets. 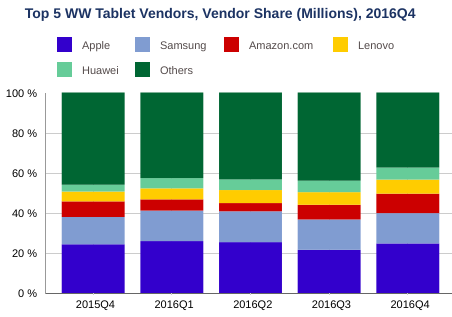 "The sentiment around the tablet market continues to grow stale despite a lot of talk about vendors pivoting their product portfolios toward the detachable segment," said Ryan Reith, program vice president at IDC. 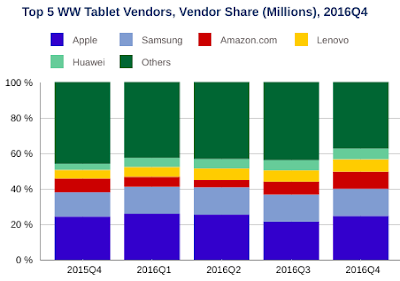 Typical tablets without a dedicated keyboard -- which IDC refers to as slate tablets -- are continuing to lose relevancy across all regions, and as a result the market decline is a truly global phenomena. Vendors that have historically led the notebook PC market are also talking about expanding their product portfolios to include more detachable tablets. IDC believes the second half of 2017 will bring a wide range of new detachable devices from the notebook PC OEMs as well as those playing primarily in the smartphone space. "The market continues to warm up to two-in-one devices, but we're now getting to a point where the price and performance disparity between detachables and convertibles has started to narrow, and this added competition led to a dampening in the growth of detachable tablets," said Jitesh Ubrani, senior research analyst with IDC. However, the analyst firm expects this to be temporary, as only two of the three major platforms have any significant hardware presence in the detachable market, and as the ecosystems are further refined with future updates and developer support. That said, expect to see more new Chromebook models introduced in 2017, as the personal computing market continues the trend towards 'good enough' lower-cost portable devices that enable secure access to a multitude of consumer and enterprise cloud-based services. The ongoing market transformation seems inevitable.